Crush injuries occur when are trapped in or under machinery or when one or more body parts are pinched or jammed. The pressure of being crushed by heavy farm machinery can rupture skin, rip muscles, severe nerves and/or splinter bone, resulting in trauma or death. Most crush accidents occur during cropping or while performing machinery maintenance. 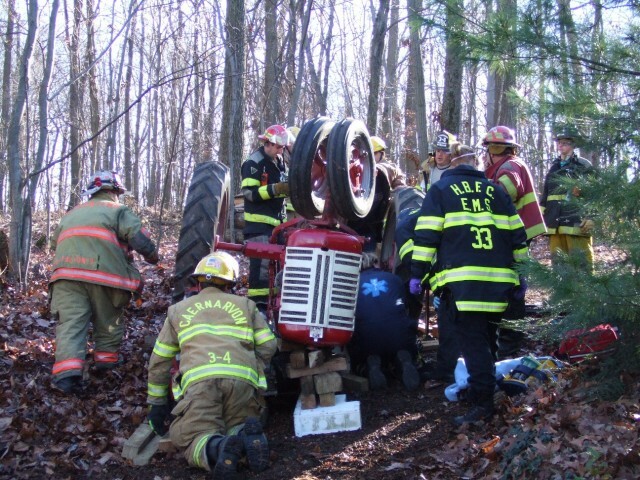 Many are caused by tractor rollovers, but crushing can also result from using all-terrain vehicles, being stepped on or trampled by livestock, having a load drop on you, adding attachments to machinery and/or having fingers pulled into moving machinery. On average, tractor rollovers crush 110 farmers annually in the U.S.
Crushing is the fifth-leading type of fatal injury on the farm. Compartment Syndrome−when muscles inside a limb swell and prevent blood flow. The result is that pressure from the swelling pinches nerves and blood vessels. Crush Injury Syndrome−This occurs when a large area of muscle is compressed and blood flow ceases. This causes muscle cells to break down, releasing acids and other chemicals. When the pressure is released, these can cause serious damage as they travel to the heart and kidneys. Treating crushing injuries requires careful assessment. Depending on how long the area has been compressed, it may be best to wait for emergency services rather than to remove the object crushing the worker, as a tourniquet or IV fluids may be necessary to stem the flow of blood and chemicals before the weight is released. The best way to determine how to help a worker injured by a crushing accident is to tell emergency services how long the worker has been trapped and by what and to wait for instruction. It’s important to remember that many crushing accidents occur as a result of unsafe machinery. Tractors can roll over, hydraulic pump lifts fail or machinery that continues to move after it has been shut off cause accidents. That means, if you or a loved one has suffered a crushing injury, or if you have lost wages due to a crushing injury, you are not at fault. You may be entitled to compensation. This includes payments over and above Worker’s Compensation.